The Dust Muzzle Ultra is based on the design of the original Dust Muzzle and is the most efficient design available for right angle sanders. The side-mounted vacuum pickup uses the centrifugal forces created by the grinding wheel to send the pollutants out the exhaust port. This method requires much less vacuum power than top mounted designs. The Dust Muzzle Ultra is connected to your industrial 2hp vacuum by a lightweight step-down hose for ease of motion. If the operator does not have a step-down hose, he will need one to connect the Dust Muzzle to the 1 1/2" hose that comes standard with all American vacuums. Like the Original Dust Muzzle, the Dust Muzzle Ultra uses the centrifugal forces created by the grinding wheel to force the dust out the side exhaust port. This design requires much less vacuum power than dust collectors with the exhaust port mounted on top of the housing. When connected to a standard 2hp industrial vacuum, the Dust Muzzle Ultra can remove up to 99% of the pollutants at the point of origin. 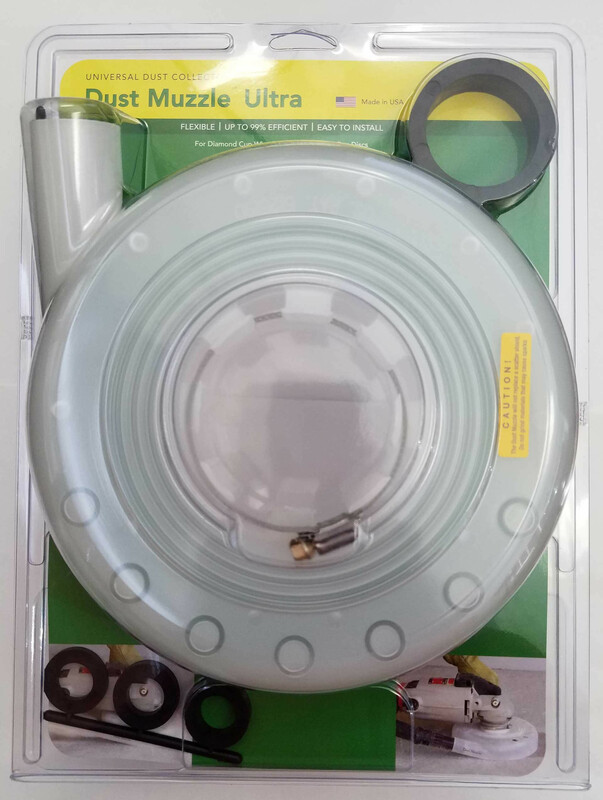 The Dust Muzzle Ultra uses an adjustable collar, spacer washers and a set of flexible adapter rings to accommodate the entire range of collar diameters and grinding wheel configurations for both the 4"-5" grinders and the 7"-9" grinders. The main difference between the many brands of grinders is the diameter of the bearing housing. This is where all dust collectors are attached. On 7"-8" grinders, the bearing housings can vary in diameter from 1.75" to over 3". On the 4"-5" grinders, the bearing housings will vary from 1.5" to over 2". Dust collectors using the flexible collar design similar to the Dust Muzzle Ultra are not able to accommodate all the different diameters of bearing housings. They tend to "pinch off" the hose clamp when they are required to compress the adjustable collar to the smaller diameter bearing housings. Figure 1. The hose clamp is being pinched off the flexible collar. This happens when the flexibility of the collar cannot accommodate the smaller diameter bearing housings. The Dust Muzzle Ultra has solved this problem. The flexible adapter ring of the Dust Muzzle Ultra makes up for the differences in these bearing housings. 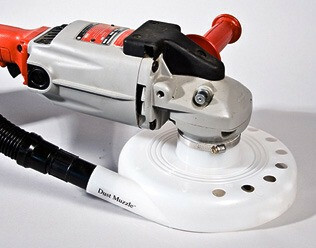 The Dust Muzzle Ultra is excellent for grinding fiberglass, concrete, wood, paints and epoxies. It can be used with sandpaper, diamond cup wheels, wet-or-dry polishing pads and soft pad discs. 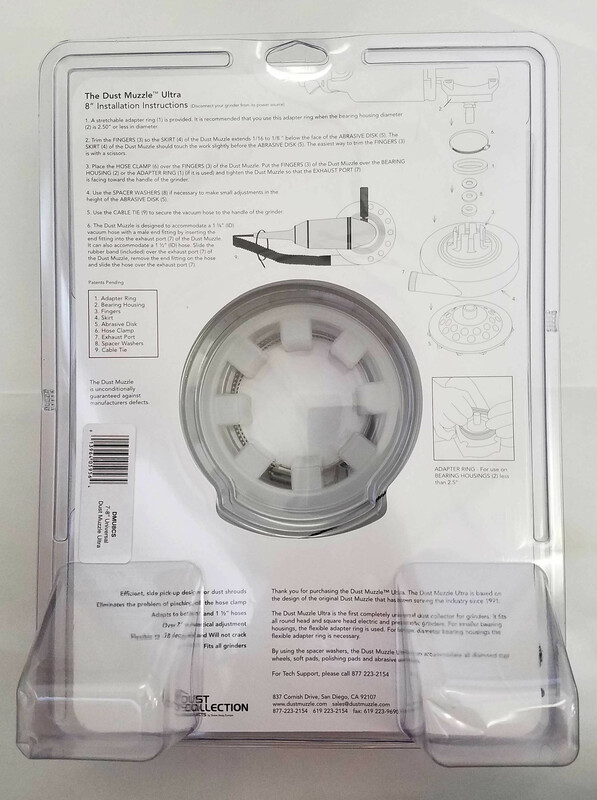 Note: When the Dust Muzzle Ultra is being used with a 7" sanding disc, a Zec™ wheel or any other wheel that is less than 3/8" from top to bottom, it is recommended that the operator purchase an arbor extender so the wheel will position itself correctly in the Dust Muzzle. Wheels 7" Diamond Cup Wheels and 8"